West Bend, WI, April, 2013- +Heiser Chevrolet Cadillac proudly announces that it has won the “Business of the Month” award for April, 2013.The award is given by the City of West Bend’s Department of Development.It is a part of the Growing Local Business program and recognizes leadership and importance to the West Bend community. The City of West Bend ( +West Bend, WI ) nominates businesses based on longevity, growth potential, and customer service.Votes were tallied for several manufacturing and small businesses before it was determined that Heiser Chevrolet Cadillac should receive the award.The local dealership has completed an extensive renovation in the past year and recently held its grand opening. This month we recognize New Car Sales Manager, Bill Lawrence for his drive to succeed and passion for the automotive industry. Bill joined the Heiser Toyota family in 2008 and has grown into a leader; one who inspires his colleagues. His mantra of Dream Big/Work Hard sets an example of success for others and is truly appreciated by the customers he serves. Bill began his Heiser Automotive career as a Sales Consultant at our Toyota dealership. He distinguished himself by earning consistently high marks in customer satisfaction. 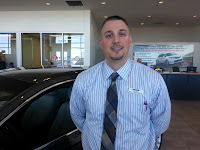 By 2011, he was promoted to Business Manager, serving both the Heiser Chevrolet and Heiser Toyotadealerships. Bill was promoted again in late 2012 to his current position.